The University of Applied Sciences and Arts Dortmund is now accepting submissions for a forthcoming symposium in Germany. The topic is photography, and you’ve got until November 30 to submit. The Master’s course Photography – Photographic Studies of the University of Applied Sciences and Arts in Dortmund invites you to submit artistic, scientific and profession-specific contributions that deal with the various uses of photography as a medium. We are equally looking for contributions to the symposium and the forthcoming second issue of the ‘cahiers’ magazine. On the basis of submitted contributions, current trends, ideas and aspects of discussion shall be identified and furthermore incorporated in the symposium and/or the magazine. Thematically, the symposium aligns itself with the ‘cahiers – Hefte zur Fotografie’ periodical. Jointly developed by students of both the B.A. and M.A. Photography programs its first issue was published in June 2013. 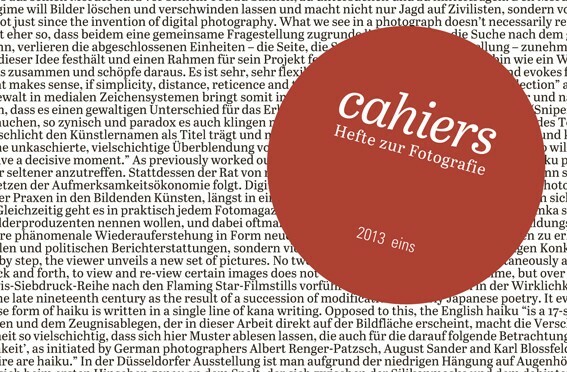 By means of essays, artistic works, interviews and critical texts the ‘cahiers’ address issues of the photographic medium from the most versatile perspectives. From all incoming submissions we will define different groups of topics, each with their own content. These may range from changes in professional practice caused by networked media, the role of the photographer in times of the reader reporter to possibilities of representing complex interrelations. In the context of an experimental conference model presentations will be complemented by keynote debates. For this purpose, we will highly appreciate your participation. When submitting, please indicate if you are available for the debates. Final submission deadline is 30 November 2013.